5 bedroom, 4 bathroom villa in the Emerald Island Resort community. Owned by Mark and Hannah Colbron. Ref: 3444. 3 Miles from the Disney theme parks. Free Broadband Wireless Internet connection. Free local, long distance and international phone calls. Pool with in ground hot tub. Child safety fence on pool deck. Gated community Which is manned 24/7. 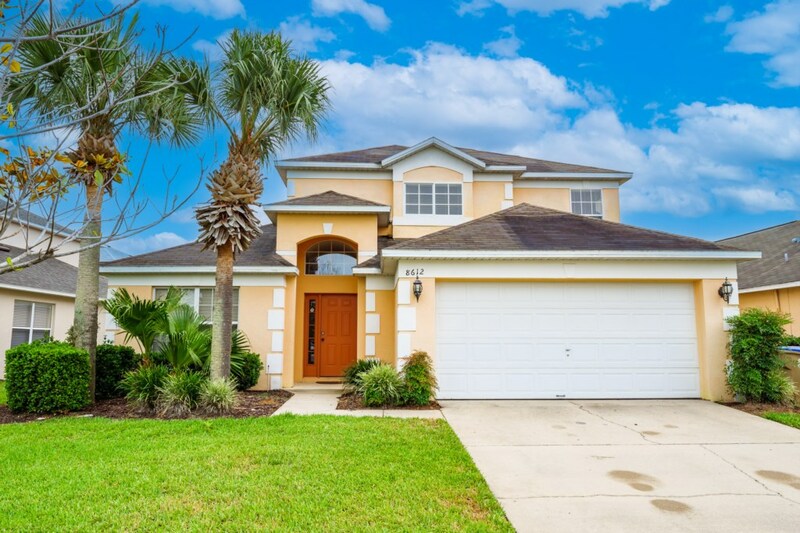 This beautiful executive pool home has 5 bedrooms with 4 bathrooms and is fully air conditioned throughout. The pool deck has a 14x28ft pool plus in ground hot tub which is South facing and is furnished with recliner chairs and sunloungers and also has a shaded lanai with table and chairs. The pool and hot tub (hot tub heated to 102 degrees)can be heated for an additional cost. The home itself has 5 bedrooms and 4 bathrooms. All bedrooms have cable TV. The spacious main master on ground level has an en-suite bathroom which has a walk-in closet, corner bath tub and a walk-in shower cubicle. There is also a double bedroom on the ground level with bathroom directly accross the hall. On the upper level there is two twin rooms which share the fourth bathroom and also a second master suite with en-suite bathroom. The garage has been converted in to a games room with pool table, foosball and air hockey tables. The living area is a large spacious room with a ceiling height of 17ft. Furnished to a high standard with Cable TV and suround sound system. The kitchen area is fully equipped with a range cooker, microwave oven, dishwasher and large fridge/freezer. There is also a seperate dining area as well as a utility room with a washing machine and dryer. The home also benefits from free broadband connection allowing guests to surf the internet from the home free of charge while relaxing by the pool! The resort itself is a gated community with the gatehouse itself manned 24/7. The resort has a clubhouse with concierge service, gathering room, video games room, Cyber cafe with free internet, fitness room and a sauna. Outside the clubhouse there is a communal pool with spa and poolside Tiki bar. £16/$27 per night.Prices Include Tax. £50/$90 for end of stay clean. Your enquiry will be sent to villa ref 3444 only. This page has been viewed 12732 times since 04 May 2011.